NEW LINEUP ADDITIONS – OVER 40 ACTS ADDED! 3-Day Passes on sale now! With 33 artists already announced, Made Event is proud to release over 40 more acts to the lineup of this year’s Electric Zoo Festival taking place from Friday, September 2 to Sunday, September 4 on Randall’s Island Park in New York City. The critically acclaimed and fan-adored festival is now spread across three days and four stages, headlined by electronic music superstars – Tiësto, David Guetta and Armin van Buuren. Friday’s Main Stage: AN21 & Max Vangeli. Hilltop Arena: Felguk, Gareth Emery, Markus Schulz and Robbie Rivera. Carl Cox & Friends Take Over Sunday School: Joris Voorn & Nic Fanciulli B2B and Victor Calderone. Red Bull Music Academy Riverside: Bart B More, Busy P, Feed Me, SebastiAn. Saturday’s Main Stage: Sub Focus. Hilltop Arena: Andy Moor, Dirty South, Joachim Garraud, Mat Zo, Sean Tyas & Simon Patterson B2B, Sunnery James & Ryan Marciano. Sunday School Grove: Carl Craig, Chris Liebing, James Holden and Steve Bug. Red Bull Music Academy Riverside: 12th Planet,Beardyman, Kid Sister, Porter Robinson, Tommy Lee & DJ Aero. Sunday’s Hilltop Arena: Big Gigantic, Carte Blanche, Fake Blood, Excision & Datsik, Jack Beats and MiMOSA. Sunday School Grove: Gui Boratto, Guy Gerber, Ida Engberg and Nicolas Jaar LIVE. Red Bull Music Academy Riverside: Arty, EDX, Hardwell, Kyau & Albert and Mark Knight. New in 2011, Electric Zoo fans have the option to purchase tickets on payment plans. Layaway options are available when ordering online, or by calling 888-512-SHOW(7469). The last date to order via layaway is July 1, 2011. 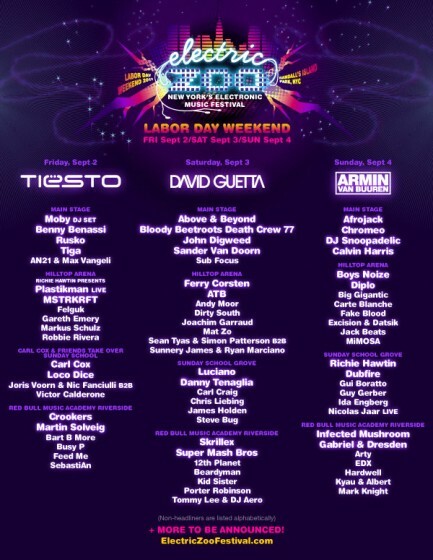 For tickets and more info please visit www.ElectricZooFestival.com. Stay tuned for more lineup announcements! Electric Zoo Phase 2 lineup announced! 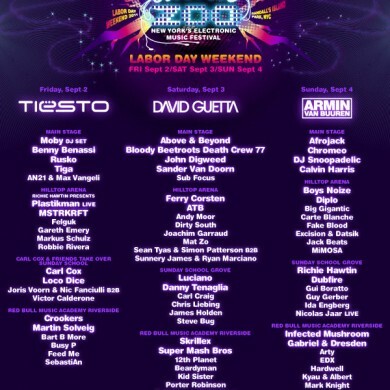 Electric Zoo 2012 Phase 1 lineup has been announced!